HOUSTON (AP) — Bobby Jucker has had it with hurricanes. In 2008, Hurricane Ike tore the roof off his business, Three Brothers Bakery. 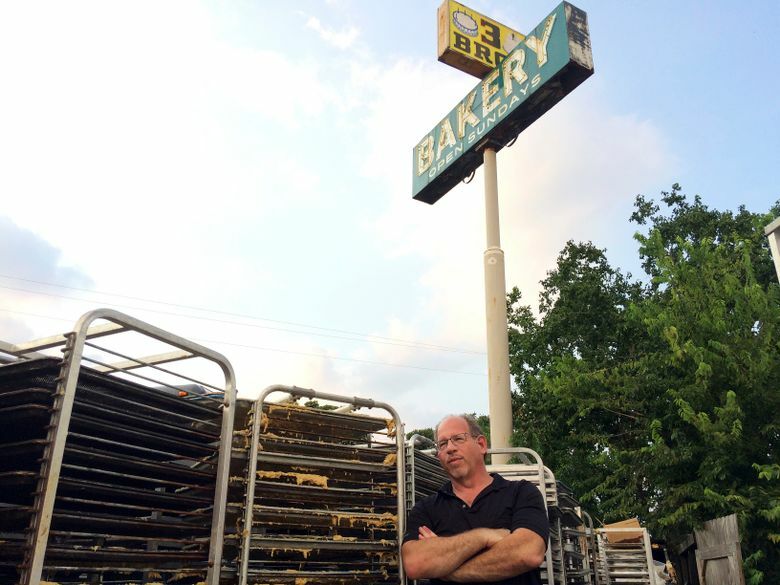 Now, he estimates, he’s facing $1 million in damage and lost revenue from Harvey — the fifth time a storm has put his bakery out of commission. He’s always recovered before. But this time, he wears the weary countenance of a man nearly broken. More than a week after Harvey poured more than 4 feet (1.2 meters) of rain on Houston, killing at least 65 people, destroying thousands of cars and leaving hundreds of thousands of families with flood-damaged homes, America’s fourth-biggest city is striving to reopen for business. Houston’s airports and shipping lanes reopened to limited traffic last week. Some workers returned to their offices Thursday or Friday. More followed on Tuesday after a long Labor Day weekend of cleanup and regrouping. The bakery lost the live yeast used for sourdough bread; Jucker will have to grow more. It had been roasting its own coffee but lost $15,000 worth of beans. A remodeled cafe at the front of the bakery was mostly destroyed. 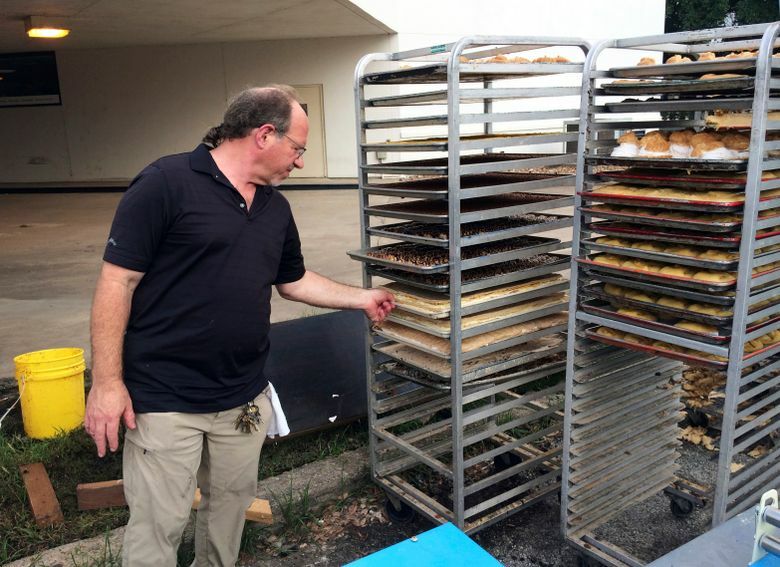 One of the bakery’s four industrial ovens has to be replaced at a cost of more than $50,000. A second one needs at least a new motor, if not a full replacement. From his son’s home, where he had taken refuge, he watched the nightmare unfold on the shop’s digital cameras. First, the yellow lines in the parking lot disappeared in the rain. Then the water seeped inside. But what sounds like a windfall isn’t. Kaufman knows it may be weeks before those customers — many of them distracted and financially squeezed by home repairs — will return to pick up their clothes and pay for the cleaning. Some might never return. Kaufman worries that some of his clients will give up on Houston and its hurricanes and move away. That’s what happened in New Orleans after Hurricane Katrina brutalized that city in 2005. “I’m worried about the business,” he says. Kaufman’s anxiety led him to seek information about a loan from the U.S. Small Business Administration, which has sent teams to Houston to provide emergency credit to businesses and homeowners. The SBA finances the replacement of damaged property and equipment and offers working capital loans to help businesses through the disaster. The interest rate on SBA business loans is just over 3.3 percent, only about half the rate on comparable loans from private-sector lenders. Peyton Williams, a project manager for a Houston contractor, says he’s hiring laborers as fast as he can, offering $150 a day through Facebook advertisements. On Saturday, he hired 50 laborers to do demolition work at a damaged apartment complex. The businesses that reopen the fastest stand to gain an advantage. 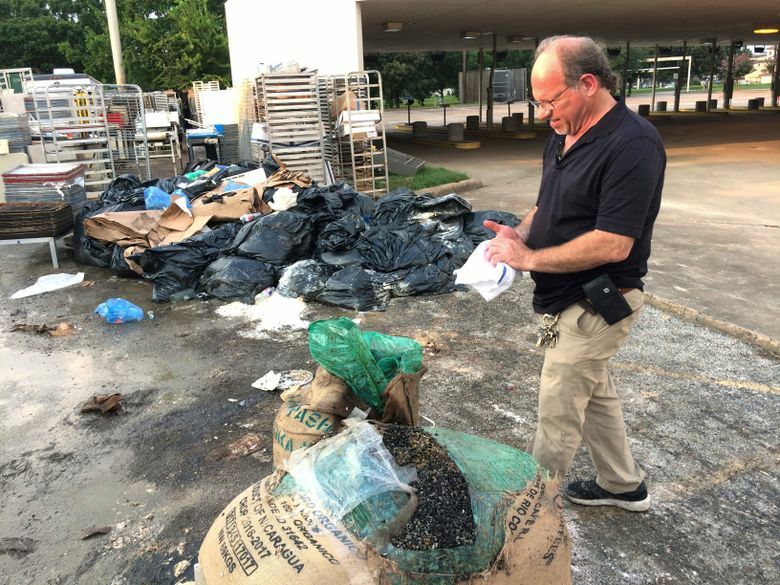 In hard-hit Kingwood, the Jason’s Deli outlet reopened Thursday after a thorough cleanup. Unlike nearby competitors, the deli was spared any flood damage. For now, says Mark Livingston, a managing partner, there aren’t many other options for residents who want or need to eat out. 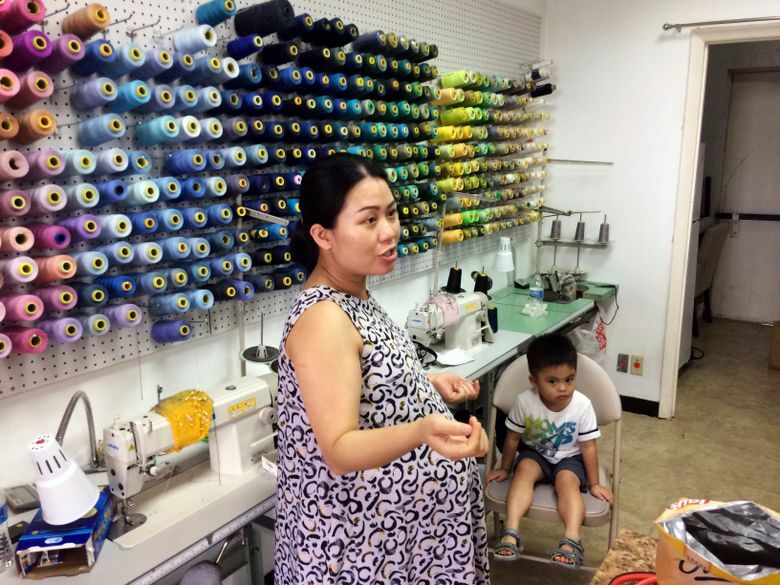 The owners of Chic Tailors, near Brays Bayou in Meyerland, didn’t wait for help. When Maria Tran and her family couldn’t find a contractor, they went to work themselves, measuring and cutting Sheetrock to replace a soggy section of wall. 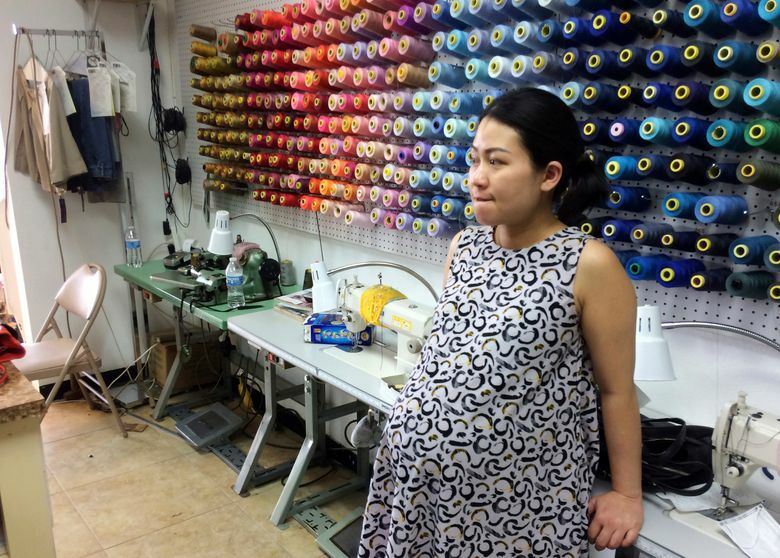 Never mind that Tran is nine months pregnant. Even her 3-year-old son, Ander, chipped in, taking out the trash and keeping watch over the others. One lawyer checked into a downtown hotel after Harvey forced him from his home and visited the empty office to inspect the computer equipment. He displayed the hardware to the firm’s technology staff in Dallas via smartphone video, allowing them to diagnose problems. For some companies, the full scope of the hardship inflicted by Harvey won’t be clear anytime soon. Will a flood-damaged strip mall come back? Or will it succumb to the damage it endured, imperiling the stores and restaurants that rent space there?